I had really subtle allergies as a kid and into college. Nothing debilitating. But then I moved to Ohio. I don’t know if my body changed or if I’m allergic to every tree/plant in the midwest, but it’s been crazy. For the first few years here, I just didn’t have the money to invest into addressing my allergies so I never got tested or received shots. As I got older, I didn’t want shots so I started to seek out alternate forms of treatment. Sure, you can avoid going outside, you can wear a face mask, keep the A/C running, eat local honey and take Zyrtec but it wasn’t working for me. Acupuncture and cupping: I go to my acupuncturist, Tessa, twice a week to get acupuncture/cupping. It takes about 1.5-2 hours. It doesn’t hurt. I often fall asleep. I will continue to do this for forever. I can’t thank Tessa enough for all that she’s done for me! Chinese Herbal Supplement: I take Yu Ping Feng San twice a day (4 capsules) that I get from my acupuncturist and it keeps my sneezing to a minimum. Plus it tastes like toasted deliciousness. Neti Pot: I use the squeeze bottle version of a Neti Pot a few times a week. I’ll use it on nights when I’m congested before bed. Nettle Tea: Nettle Tea is one of those things where you Google it and it says it helps with like…everything. Kind of like Coconut oil ha. I try to drink it every night. I try to sleep 8 hours a night (lately this hasn’t worked) and eat real food. Again, this is what has worked for me. I love not sneezing every day. I love driving with the windows down. I love being able to take morning meetings. I LOVE THE ENERGY. I hope this helps someone else. *PS I still take Zyrtec every night. I’m too scared to stop but can tell you that it didn’t help much in years past (besides preventing my eyes from itching). I’m really glad you shared this. My allergies hit hard around the end of April and I definitely didn’t tackle them as well as I would have hoped. I’ll definitely look into acupuncture and natural teas to avoid becoming an antihistamine zombie again. You definitely should! And let me know if it works out for you because I tell ya…I feel like a different person! Yes! Just emailed Tessa to set up an appointment!! Thanks for the info. This year has certainly been a rough one for allergies. I think that acupuncture is the next thing I’m going to do for my all over health and it if it stops my ear and sinus infections bonus! I bet it will! I feel like it can help with EVERYTHING. So glad I discovered it. Great ideas! I have terrible allergies – lately I’ve been having sinus headaches because of them that are positively debilitating. I’m always open to anything new that might help. I love my neti pot! I was pretty terrified of the neti pot at first but oh man – so amazing. 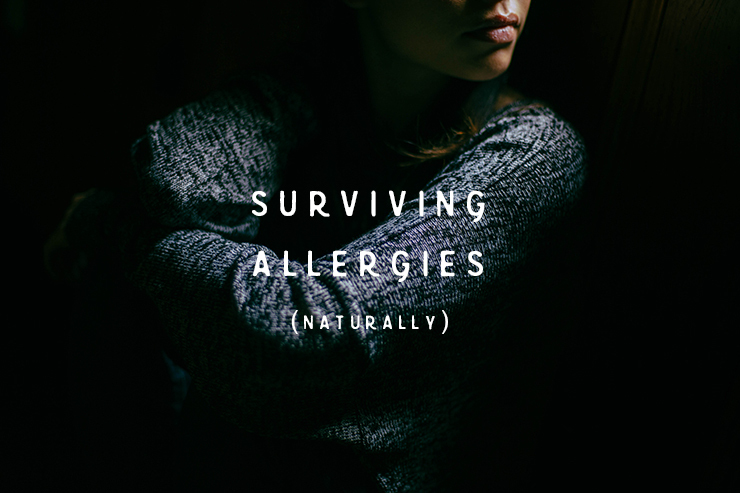 This article was so helpful I will be trying some these when my allergies start acting up. Thanks for sharing! My pleasure, Marie!! Hope it helps. Lack of sleep AND too much stress are several of the bigger factors for my sinus allergies. It can also be helpful to keep a food diary for awhile as well to see if there are any foods that trigger allergies. Yes, sinus allergies triggered or made worse by certain foods. HFCS… or Pepsi & Coke made with HFCS seems to be one of several for me and part of why I cut soda out entirely (ok I occasionally drink a soda made with sugar.) And too much starch for me causes a wide array of problems. Beer is also a problem and I think it’s mostly the hops (dark beers are usually a lot better.) Everyone is a little different though which is why I’m suggesting a food diary. Oh and sunshine – I need to get outside regularly in order to stay healthy. And…. some people freak out if I say this … in the winter when it’s cloudy and overcast and the days are shorter I will sometimes go to the tanning beds a few times a month. Other natural lightbulb and Vit D supplements didn’t help me in the winter (but those things might help other people.) I know I know … I’ll get skin cancer someday … but what’s the point in living if I’m so sick I rarely enjoy living in the now? I’m not advocating going too much or going to get pretty tans, I’m saying it’s had a positive health impact for me (and the staff at the tanning salons always give me weird looks because I’m not uber tan even doing this.) I used to get bronchitis on top of the allergies really badly at least once if not twice a year before I started tanning a bit in the winter. Nothing like losing 1-2 entire months each year being so sick you can barely breathe. And then at least half the year worrying where the kleenex box was. The things that helped me were lots of little changes that helped with no single cure. Take one away one piece of the puzzle and my allergies don’t come back full force but they come back little by little just like they were helped little by little. I haven’t tried the nettle tea so that’s now on my list of things to try. :) Always good to have another functional tool in the tool-belt.